Marshall Electronics Optical Division - 1/3" Color Microscope Camera for the automobile, industrial video, covert security, and surveillance markets. 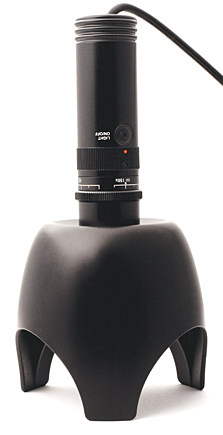 The Marshall Microscope Zoom Camera uses cutting-edge display technology for outstanding magnification and color resolution. Simply plug the camera into your monitor's video input, adjust the focus, and you'll be amazed by the detail and clarity of even the smallest objects. This is a must-have tool for industrial inspection of PC boards and metal surfaces, as well as an essential instrument for scientists and educators who want detailed views of specimens. The Marshall Microscope Zoom Camera can also be used in healthcare and beauty fields for up-close inspection of skin, hair, and nails and offers hobbyists/collectors critical assessment of coins, stamps, precious gems and more.